Editorial note: Updated at 4:45 p.m., April 24, 2015, after the on-sale times for the fight tickets, closed-circuit viewing parties and weigh-in hit. Tickets to all of these events have sold out. The welterweight world championship unification bout between Floyd “Money” Mayweather Jr. and Manny “Pac-man” Pacquiao is being hyped as “The Fight of the Century,” or as we like to call it MayPacalypse. Everyone in boxing is eagerly anticipating the match. Fans have been hoping for it since 2009. Well, if you blinked, you missed it. A limited amount of tickets (reported to be 500) went on sale Thursday, April 23 at 12 p.m. PDT and sold out in less than two minutes. Offered through MGM Grand and Ticketmaster, they were priced at $1,500, $2,500, $3,500, $5,000 and $7,500. The rest of the tickets in the 16,800-seat MGM Grand Garden Arena are reserved for VIPs, high rollers and sponsors as well as the promoters. Some of these tickets will be available in secondary markets, but seats will sell for much more than the face value pricing (especially those located ringside, which may top $100,000). Interested in trying to win tickets? Those options are limited too. We’ve found a charitable endeavor for the Orangewood Children’s Foundation that’s offering two tickets to Mayweather vs. Pacquiao as a prize. For a minimum contribution of $10 at their Fight for Charity page, you’ll get 10 entries in a drawing for a VIP package for two that includes airfare, a two-night stay at MGM Grand, tickets to the weigh-in and the chance meet “Extra” host Mario Lopez…along with the seats at the main event. MGM Resorts International has exclusive closed-circuit telecast rights to the fight, which means you’ll only be able to see it at one of their properties. In addition to MGM Grand, this includes Aria, Excalibur, Luxor, Mandalay Bay, The Mirage, New York-New York and The Signature. Tickets to attend these broadcasts cost $150. They went on sale Thursday, April 23 at 3 p.m. PDT. Click here for more details about that. Unfortunately, like the fight tickets, these viewing events have already sold out. It is not known at this time whether more closed-circuit viewing parties will be added or if other venues will be allowed to show the fight. By exercising their rights, broadcasts will be blacked out at other hotel/casinos on the Las Vegas Strip, in downtown and throughout Clark County. The fight is being broadcast as part of a joint venture between Showtime Sports and HBO Sports and distributed on pay-per-view. The record-breaking cost has been set at $89.95 for standard definition and $99.95 for high definition. Pay-per-view broadcasts are available to residential cable network subscribers. You won’t be able to order and view the fight from your hotel room. 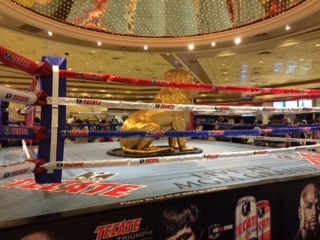 The official weigh-in is scheduled for Friday, May 1 at 12 p.m. PDT at the MGM Grand Garden Arena. You must have a ticket to attend. Tickets went on sale for $10 each on Friday, April 24 at 12 p.m. PDT. They have already sold out. This is the first time admission has ever been charged in Nevada to attend a weigh-in. Tickets were issued in an effort to control crowds, with all proceeds being divided equally between two charities – the Susan G. Komen Foundation (Mayweather’s choice) and the Lou Ruvo Center for Brain Health (Pacquiao’s choice). Other events are scheduled for earlier in the week. The fighter arrivals will take place on April 28 in the MGM Grand Garden Arena. Doors open at 1:30 p.m. PDT. However, reports indicate that Pacquiao may not show up. On April 29, the main event press conference will take place (this is not open to the public), along with undercard fighter workouts (this will not include Mayweather and Pacquiao) in the MGM Grand Garden Arena lobby beginning at 3 p.m. PDT. A press conference for the undercard (again, this will not include Mayweather or Pacquiao) is scheduled to take place on April 30, but is not open to the public. More information about these events is posted on MGM Grand’s Fight Week page. Regardless of how you view it or what events you are able to attend, this promises to be an exciting battle between two of the greatest fighters of their generation. 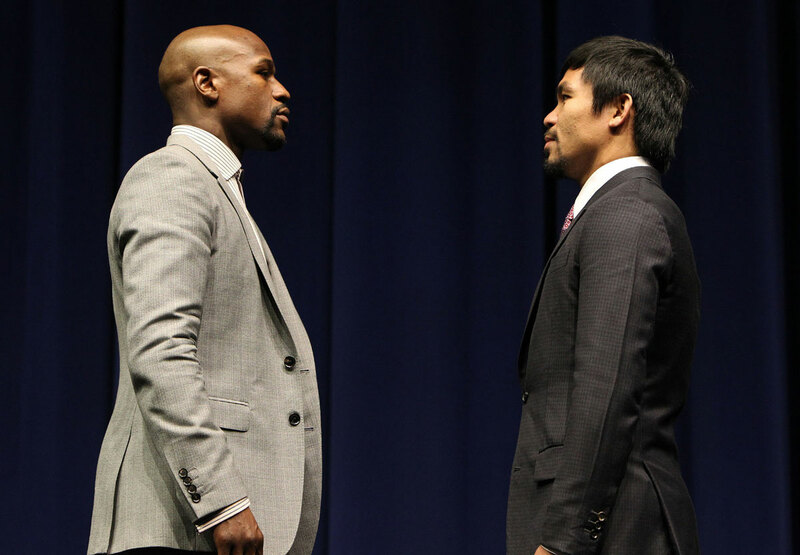 Both Mayweather and Pacquiao have incredible punching power, with a combined total of 64 knockouts between them. Both are also capable of going the distance. An 11-time world champion in five weight divisions, 38-year-old Mayweather is undefeated. His record is 47-0. His latest victory came in September 2014 with a unanimous decision over Marcos Maidana. Look for Mayweather to sport one of his customized $25,000 mouth guards as well as have pop star Justin Bieber in his entourage at the May 2nd showdown. A congressman in the Philippines, 36-year-old Pacquiao is a hero in his homeland and one of boxing’s most charismatic figures. He’s the only fighter to win eight world titles in as many different weight divisions. Pacquiao is the current WBO welterweight champion, regaining that title last year in a unanimous decision over Timothy Bradley Jr. He’ll enter the ring while his newly released ballad “Lalaban Ako Para Sa Filipino” (which means “I Fight for the Filipino People”) plays. The clash between Mayweather and Pacquiao is expected to be the highest grossing fight ever, with overall revenues potentially surpassing $300 million. 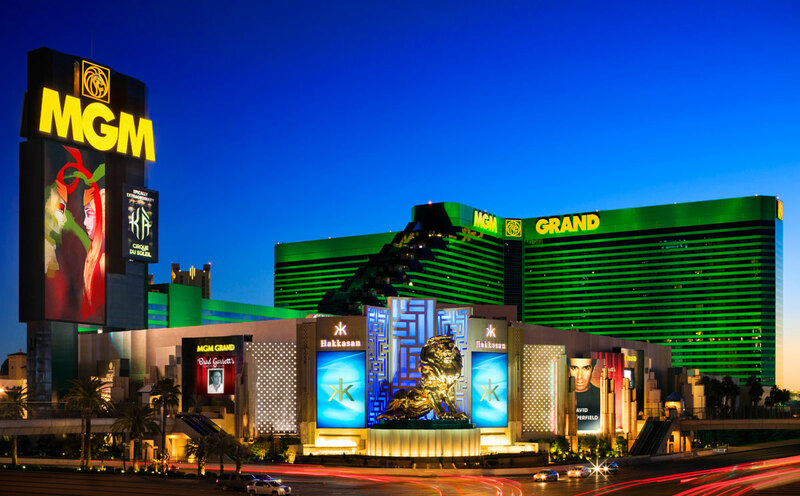 MGM Grand was a natural choice to host the event considering that Mayweather’s last 10 fights and five of Pacquiao’s last seven fights were held there. In total, Mayweather has fought at MGM Grand 13 times and Pacquiao 11 times. Even if you don’t have tickets to the fight, you can party like a champion in Vegas. Many of the pool clubs and nightclubs will be hosting events featuring the hottest hip-hop and EDM artists around. We’ve compiled a list of the top contenders here. Odds courtesy of Vegas Insider. I’m a Las Vegas native. By profession, I write at Vegas.com. Mostly about the city’s hotels, but on other topics – gaming and transportation – too. I really love staying at hotels. And the ones here are among the biggest and best in the world. Some key things I’ve learned: Resort fees are inescapable (frustrating but true), a friendly attitude at the front desk may score you a great view and over-the-top room amenities – bath butlers, Japanese tea service, menus with “intimate” items – do exist. What else should you know about me? Well, I’m comfortable at a blackjack table. And I like eating late-night pancakes in hotel coffee shops. A lot. Follow Renee on Google+.